Amethyst beads of various colors and a lavender agate donut surrounded by darker amethyst beads... The gemstone beads are strung on elastic cords making this bracelet easy to put on and take off. One size fits all. 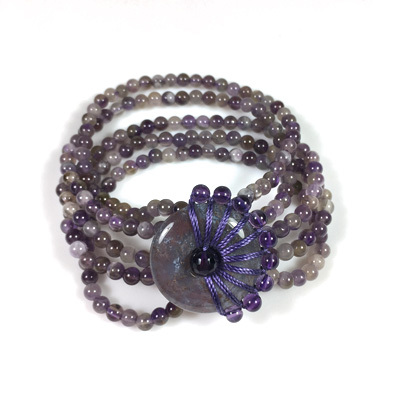 Mixed amethyst beads on elastic cord. Lavender agate donut 25 mm in diameter. Knotted with nylon thread and amethyst beads.